This is one of the biggest recurring myths that I see, and was leveled against both McCloud's panel transitions (see below) and my own model of narrative grammar. Somehow, because we focus on the relations between panel content, it is seen as denying the "meaning" that arises from a page layout. This myth conflates content and layout. Content is the meaningful connections between the depictions within panels. 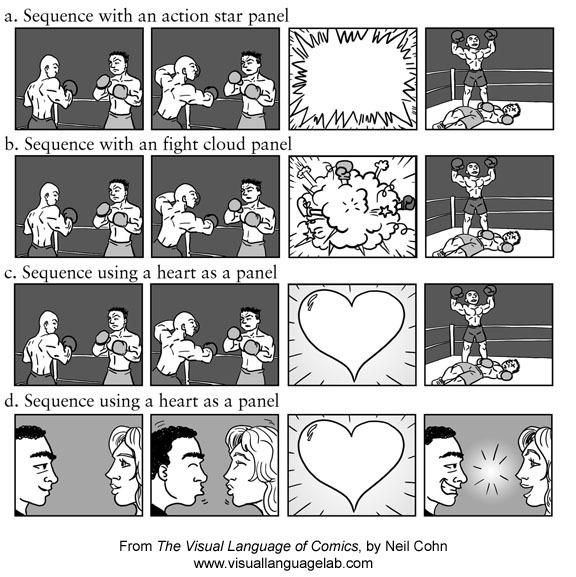 Page layout is the physical arrangement of panels on a canvas (like a page). While there are some cases where page layout can factor into the relations between panel content, these are not the same thing and are fully independent structures. 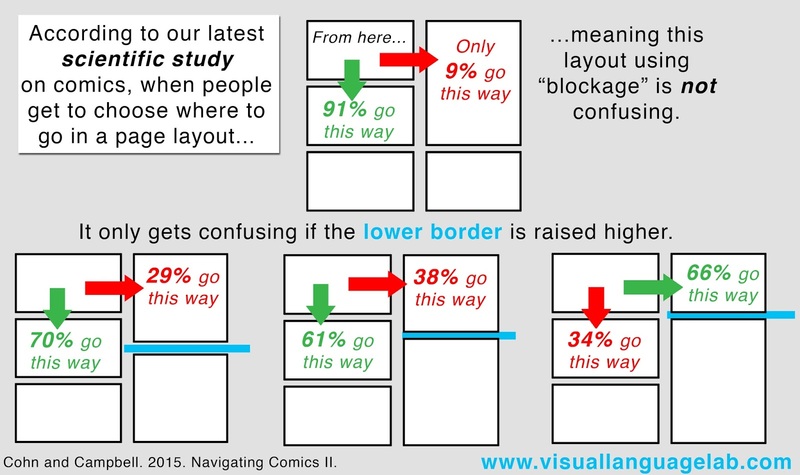 First off, it is easy to see that layout and content are different because you can rearrange panels into different layouts and it does not change the meaning. So long as the order of panels remains the same, then it doesn't matter if six panels are in a 2 x 3 grid, 6 panels vertically, or 6 panels horizontally. Now, you may end up manipulating the visual composition of panel relations by rearranging them, but that is still not necessarily the same as the "understanding" that is derived from the relations between the meaningful content in images. Second, we also know that page layout is different from content because we've done experiments on them. In two separate studies, we gave people comic pages with empty panels and asked them to number the panels in the order they'd read them. We find that people choose consistent orderings of panels, even in unusual patterns, that does not rely at all on panel content (pdf, pdf). That is, knowing how to "read" a page is not contingent on panel content. Also, in a recent study we actually tested the difference between single-panel viewing and panels arranged in a 3 x 2 grid. 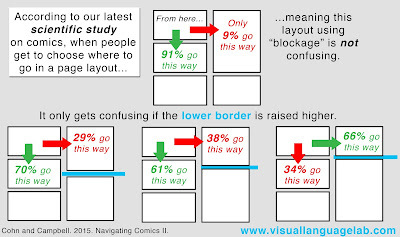 We effectively found little difference between what people look at and how they understand the panels in the different "layouts." In this case, alterations of layout makes no difference on comprehension of content. Finally, when we do an experiment where we present panels one at a time, it is not a confound of how people actually understand sequential images. In fact, it is the opposite. These types of experiments aren't looking at "sequential image understanding" in general, but each experiment focuses on specific aspects of comprehension. In doing science, you want to factor out as many variables as you can so that your experiment focuses on the specific thing you are examining. If we included page layout, that is one additional variable that might confound the actual specific things we're examining. I have great fondness for McCloud's seminal theories on comics, but we've reached a point where it is clear that several of his claims are not accurate. In particular, the belief that we "fill in the gap" between panels is simply not correct. While it is the case that readers definitely make inferences for information that is not depicted, this inference does not occur "in the gutter" and also not in panel-to-panel juxtapositions (pdf). We've now shown evidence of this for several experiments. First, when we do examine how people make inferences (like in action stars in the image to the left, or when that image would be deleted), the evidence for understanding missing information is not reflected in the gap between images, but in understanding the content of the second image relative to the first (or relative to several previously). We see this with slower reading times to the panel after an inference (pdf), or to particular brain responses associated with "mental updating" at the panel after an inference (pdf). Also, we've shown that people make predictions about what content will come in subsequent images. In one study, we showed that disrupting a sequence within a grouping of panels is worse than disrupting it between groupings (pdf, video). Crucially, the disruption within the first grouping was understood worse than at the break between groupings. Because both of these disruptions appeared before the break between images, people could not have been using the "panel transition" at the break as a cue for those groupings. Rather, people's brains had to have been predicting upcoming structure. This means that there was no "filling in the gaps" because the subsequent image relationship had not yet even been reached. You can also just ask people about relations between panels: if you give them a "yes/no" rating of whether panel relations are comprehensible, they will consistently say that those expected to be anomalous are indeed incongruous. Or if they rate sequences on a 1 to 7 scale, they will consistently rate the incongruous ones as lower than the congruous ones. While conscious interpretation can be somewhat problematic (see below), people are fairly uniform in their assessment of whether something "makes sense" or does not. 4. Consciously explaining a relation between panels is different than an immediate, unconscious brain response. This one is particularly important, especially for understanding experimental results like reaction times or brain responses. When you derive meaning from a relationship between panels, your brain will respond in a way that attempts to integrate those meanings together. Sometimes, no relation may be made, and you can measure this relationship by comparing different types of relations to each other. This brain response is also very fast: Brainwaves reveal that people recognize the difference between incongruous or out-of-place panels and congruous panels in a sequence in less than half a second. This type of "meaning" is different than what might be consciously explained. Sure, you may be able to concoct some far flung way in which two totally unrelated images might have some relationship. However, this post hoc conscious explanation does not mean that is the way you brain is deriving meaning from the relation between images, and is far slower than that brain process. In fact, such explanations are evidence in and of themselves that the relationship may be incongruous: if you have to do mental gymnastics and consciously explain a relation, you are compensating for the clear lack of a relationship that actually exists between those images. Want more advice about how to do research on the visual language of comics? Check out this paper and these blog posts. I agree with you that the content is on a separate level from the panel structure. I think panel structure can support the content, by reinforcing certain elements (for example speed, time, moods...) I imagine it as if you listen to a song on different devices in different rooms, they give you another feeling, might help you connect to the music ... even thou the song(content) is the same in every situation. To your 4. point which I find really interesting I wonder whether you also experimented with form (for example when the next panel is in the same style, but content wise doesnt make sense; or when it makes sense story wise but suddenly is in a different style) or only with content. Anyway, just random thoughts. I enjoyed reading it. Keep it up!